Lightning's Girl: Cindytalk "Camouflage Heart"
Atmospheric, moody, heavy, noisy, ultra distorted guitars and bass, with a prettiness underlying it all. How was this not on 4AD Records? 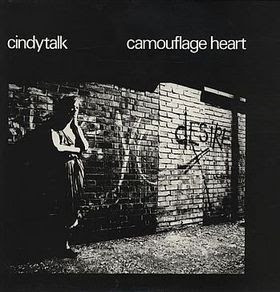 This reissue of Cindytalk's first record is highly recommended! It features the vocal talents of Gordon Sharp, who also sang on the first This Mortal Coil record. If you are familiar with his singing from This Mortal Coil, prepare to be taken aback. Gordon Sharp has a subtle strain kind of yelling throughout Camouflage Heart but he does it so well it almost sounds like singing! It's Luxury is definitely the most "catchy" song but the rest of the record is great, just a little slower. This record is not for everyone but if you like 4AD records type stuff you will probably love this!